Summer is wrapping up, and many are prepping to get back in the swing of things with school. If the thought of going back to school fills you with dread and anxiety, you’re not alone. If something just doesn’t “feel right” and you aren’t sure why, you may be dealing with a mental health condition. If you’ve dealt with traumatic events in your life, that may be a contributing factor. Did you know that half of all mental health disorders begin by the age of 14, and about 75 percent begin by the age of 24? But it’s also important to know that mental health issues are common and treatable. Don’t suffer in silence! It’s important to know the signs and symptoms of mental health issues and seek help. Free, confidential, and anonymous screening tools are available at MHAScreening.org to find out if you or someone you care about may have symptoms of a behavioral, emotional or cognitive disorder. Mental Health America (MHA) has also developed tools and resources to help increase your understanding of how traumatic events can trigger mental health concerns. You can learn how to understand trauma’s impact on mental health, and recognize mental health concerns like anxiety, psychosis and depression. While you do not get to choose what happens to you, you do get to choose how you respond. Learn more at mentalhealthamerica.net/back-school. 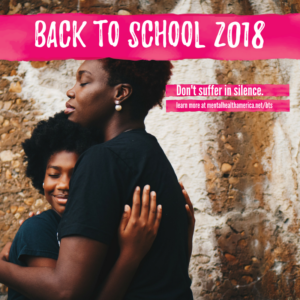 This school year make smart choices about how to deal with difficult or uncomfortable feelings - and learn why your mental health matters. Just like physical health, taking care of mental health struggles early can help to prevent more serious problems from developing in the future. If you are concerned that you or someone you know may be experiencing a mental health problem, it is important to act before Stage 4. Start the conversation. Seek help from a trusted adult. Remember there is nothing to be ashamed of and that there is help and hope. Don’t know how to start the conversation? MHA has tips and information to help get you started at tips4talking. There are also serious signs that someone is in crisis and needs more immediate help. These include thoughts or plans of hurting oneself or another person. If you or someone you know is in crisis call 1-800-273-TALK (8255), text “MHA” to 741741, or call 911.